Pedestal sinks consist of a sink and a base, which are usually separate. The base mounts onto the floor and sometimes houses the drain pipes, and the sink sits on top of the pedestal with the drain hole aligned with the stand. 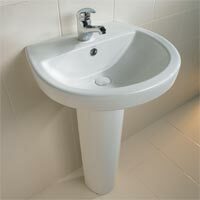 There are many designs available for both sinks and bases, and in most models both parts can be replaced individually. Pedestal sinks are generally associated with bulky white porcelain sinks and thick stands, but they now come in various materials and design themes. Among the most common styles are glass bowls, metal stands, and vessel sinks. Vitreous china and cast iron are a good compromise between traditional and contemporary design. There are also pedestal sinks designed for small bathrooms and legged pedestal sinks that can double as console sinks. Small bathrooms can also benefit from contemporary pedestal sinks. Because of the base’s vertical construction, the sink directs the eye upwards and can make a small room appear larger. The sink part can also extend to the sides to provide counter space. Pedestal sinks also use up minimal floor space, and if you have your sink custom-made, you can even turn the base into a storage shelf. Installation is more complex for pedestal sinks than above-counter models, especially when relocating or mounting a new base. This is because drain connections are located on the walls or floor, and laying out the pipes to accommodate the new sink can be expensive and time-consuming. In most cases, the base has to be mounted and secured before putting the sink in place and establishing wall drainage connections.